A geographic map of Riiga. For a political map, visit the People page. As of September 2014, this wiki and the world of Riiga are undergoing a rehaul. If you have any questions about this process, feel free to contact me via the Contact page above. 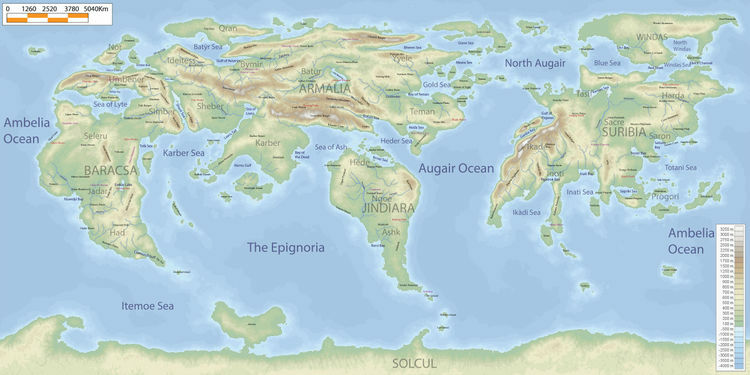 Riiga is a fictional world that has been created by Treijim (myself) and Xennavor (my brother). It was started in early 2005. Having previously made up numerous fantasy worlds throughout our childhood, we decided we needed one we could share with the world, as the last world was more of a personal project of ours. Riiga, though mostly our creation, has also had input from friends of mine, and it is also where pretty much all of my stories take place. Unless explicitly stated, the contents of every article are written from the point of view of educated humans around the year 1000AL. The viewpoints of the Kingdoms of Benevis dominate. This page was last modified on 27 March 2017, at 09:04. This page has been accessed 50,695 times. Content is available under Creative Commons Attribution-NonCommercial-NoDerivatives 4.0 International License unless otherwise noted.